Hello, friends! I’m finally back and eager to jump back to cardmaking! I’ve missed going through various stamps on my desk, picking out pretty papers and making things with my hands. 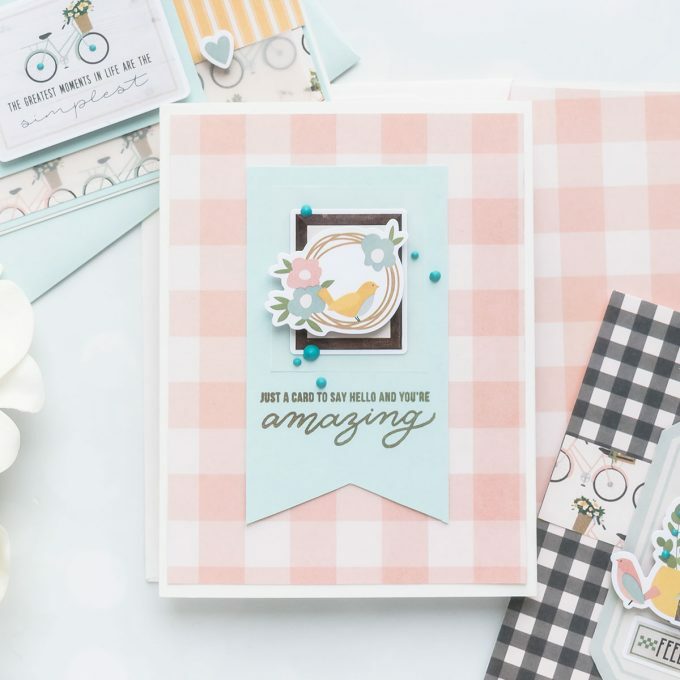 Today I have a trio of cards created using Simon Says Stamp April Card Kit – “Hello Darling“. We are actually only days away from the new, May kit going live (on April 14th), but the April Kit is still available if you’d like to grab it. All of my cards use supplies from the kit only (plus double sided tape from my stash and a sheet of vellum on the card above). 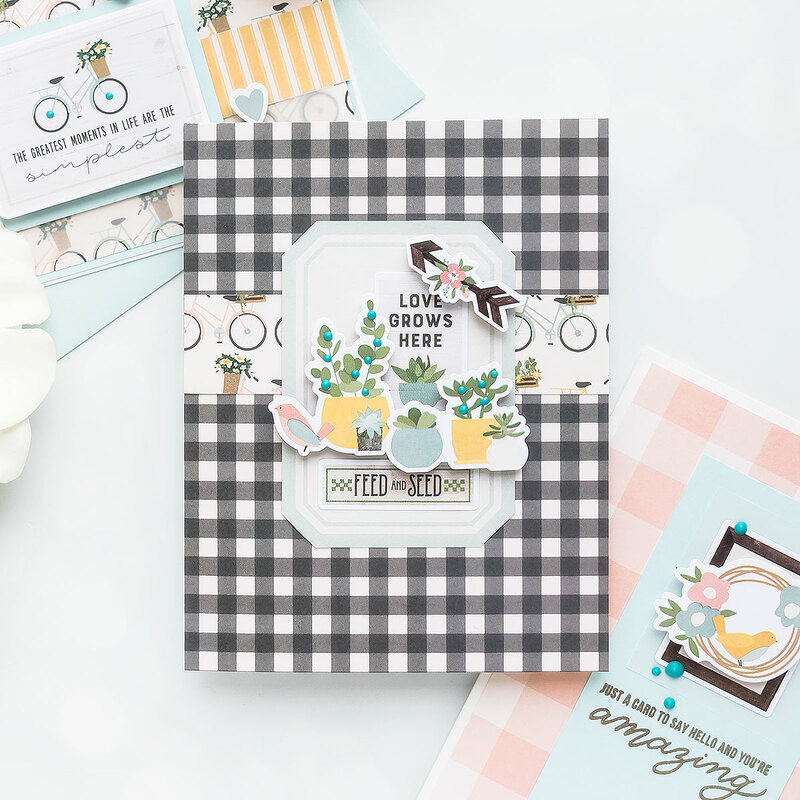 I focused on using pretty patterned papers, gorgeous garden-themed stickers and beautiful soft solid cardstock sheets from the kit. I also tried to incorporate the Nuvo Drops that come with the kit and here I used them to make tiny blue flowers on the potted plants. On the card above I added blue dots to the centers of bicycle wheels. The last card I have for you today is the simplest of all. To create sentiment for this card I used stamp set included in the kit and stamped it in brown ink. I was planning to pair this card with a brown envelope at first (as I thought it would have looked good with the brown sticker that looks like a frame) but changed my mind later. I also added patterned paper to the inside of the envelopes, the flaps, to have them coordinate with the cards. 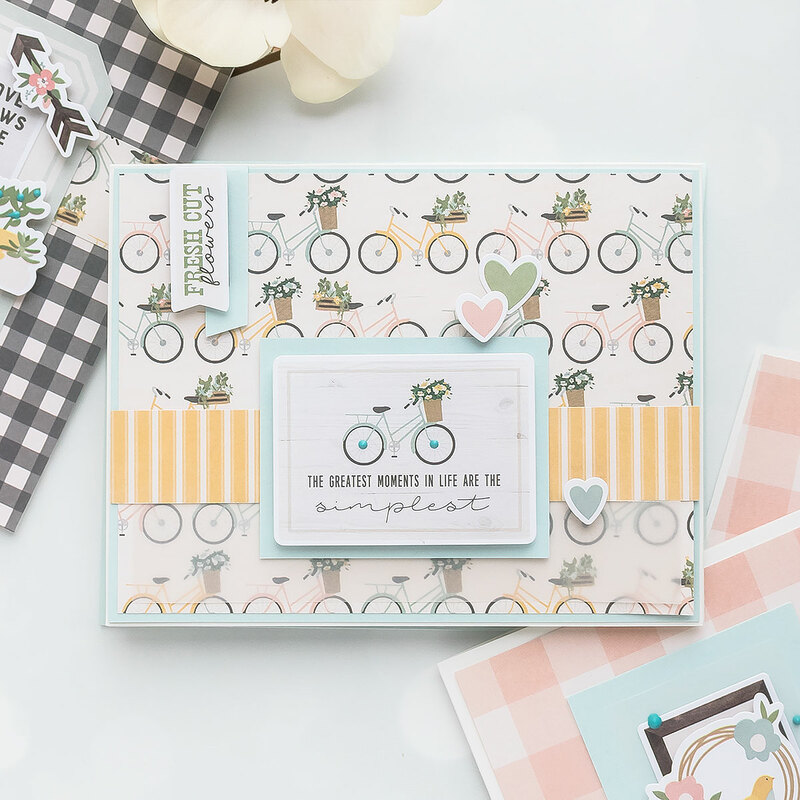 I love making handmade cards using card kits – things are all coordinated for you and all you have to do it enjoy! So glad you’re back! 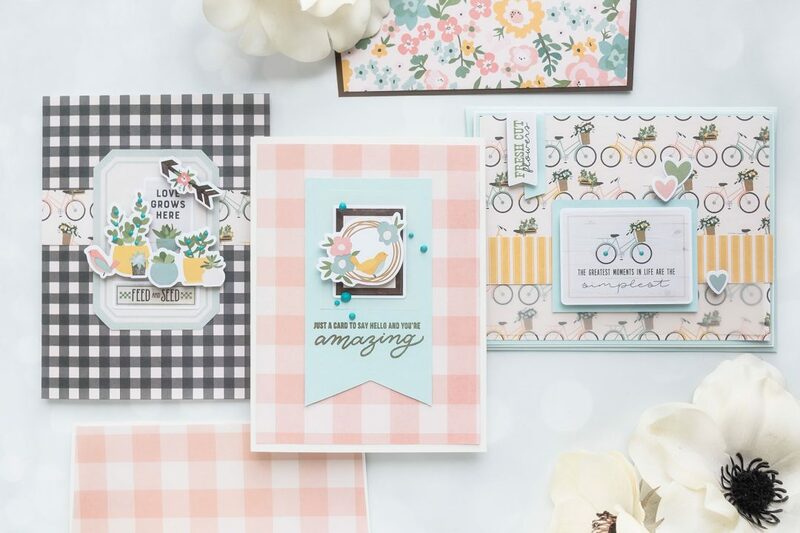 Lovely Springtime cards. Thought I heard you on NPR in the states yesterday. ? You’re back!!!!!!! YAY!!!!! Glad to hear you’re home again safe and sound. i had to pop over here from my email and sayim so glad youre back! now i just need a yana video to make my happiness complete! love you! These cards finally made me go purchase the kit. I had been wavering. Glad to see you back to posting…I get the best ideas from your work. So happy you’re back, I missed your unique style which I love!